Anyone ever backpack in the Grand Canyon? I'm going first week of March. Doing Bright Angel Trail to Hermit trail loop and never been there before. We are flying into and out of Las Vegas. Any must sees on the way to/from LV? Any side trails/overlooks that can't be missed? Any general advice for hiking there in March? *Love the new travel forum, will post pics when I return! Wish I could add Zion on there as well, but in negotiations with the wife I had to concede a couple days in Vegas by the pool to recoup from the backpacking. We hiked up and down the Tanner Trail on the South Rim. It requires a back country pass but it was a great hike with fantastic camping down by the river. The only people we saw were a couple of float trips heading down the river. We camped once at the Dessert View Campground (which is much nicer than the Grand Canyon Village) and walked to the rim through the brush. I had my camera around my neck and was carrying my 11 month old son. We stumbled on a mountain lion who didn't seem too bothered by us. I practically throw my kid to my wife and try to get the lens cap off of my camera. By the time I did this, the cat started to trot away and I started after it. My wife grabs me and yells, "don't you chase that cat!" and I never got a good picture. I also had to get up and go out with her every time she had to pee in the night after that. Did bright angel, don't recall the other. Bryce and Zion. Not sure if you'll be able to day hike up Zion(you hike in the river). Flash flood possibility. I hiked that in Dec in a wet suit.. only ones there. Awesome. Either Zion or Bryce can be done in a day. If you can't hike up Zion(short), Bryce is more visually appealing. Hiking up Zion, I liked it better than the grand Canyon... The pool can wait. Bahh... It's awesome. Sounds like you'll have a good trip. Wouldn't go out of my way, but we passed a sign for the little grand Canyon, so we pulled over. Kinda neat. 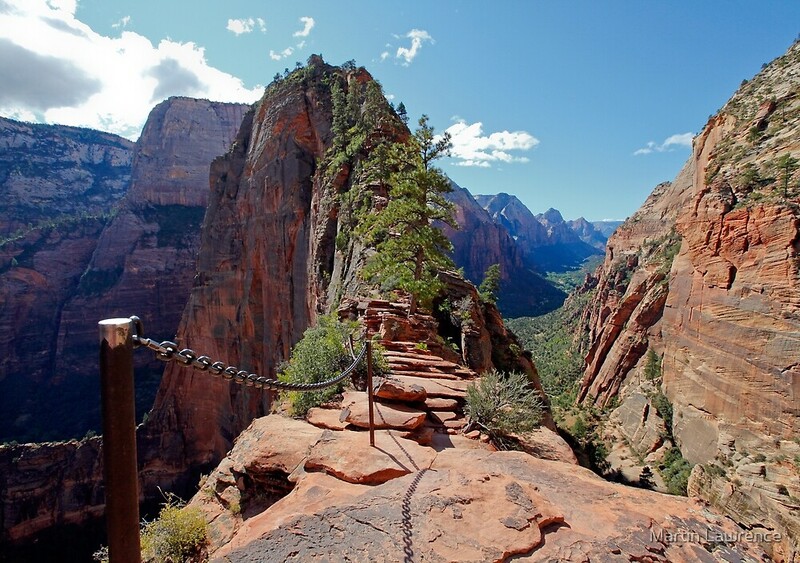 You could do Angel's Landing in one day at Zion and make the drive. The wife and I did this hike. It was awesome. Zion is just so beautiful, I can't even describe it. For a twist, try horseback riding in the Escalante area adjacent to Bryce. Great experience to ride through slot canyons. Zion is awesome but Bryce is other wordly. Both get crowded in season as does Arches, which is also mind boggling. For me, the place to go hiking is SE UT, to Mesa Verde among the Anasazi ruins. The St John River can be floated. Did you hike Zion narrows? I did last August. It was a blast and I highly recommend it. Wear good shoes if you do it because the uneven walk can hurt your feet. Also bring a water with you unless you want to drink the water in the narrows haha. Water was too high when i was there. Just dipped my feet in. Would like to go back and hike the Virgin River, and Angel's Landing. Every hike in the GC is awesome. My 20 year old daughter backpacked by herself for 2 days from the North Rim to the River and back on the Bright Angel last May. She said it was a great 2 day trip. Unfortunately the North Rim is closed in March. I have done day hikes in March from the South Rim on Bright Angel down to Indian Gardens (about 3.5 miles each way). I would go further than Indian Gardens if I was going to camp just to get away from the day hikers. Down to the River and back from the South Rim would be a good 2+ day trip. FYI weather is mixed in March. The first time I went in March it was snowing on the south rim with 4-5 inches of snow and the next day down in the canyon it was close to 60 degrees. Another cool hike is Havasu Falls - it's not technically in the GC. My daughter hiked it with a friend and camped for 1 night. Said it was amazing. You'll need a special permit from the Havasupai tribe. How'd this one turn out? I'm doing a rim-to-rim in May (South Kaibab and North Kaibab) and I'm interested to hear any and all things Grand Canyon. Well, suffice it to say it was awesome. I wrote out a big post, but lost it somewhere along the way. Will type it again into word and just copy/paste eventually. Pictures will come after I get the chance to get them off the camera. We drove down to the Grand Canyon Village from Las Vegas on Sunday, stopping at an REI for IsoPro and at the Hoover Dam on the way. Great views of the Dam from the new Tillman bridge they built there since that last time I went to Vegas. We checked into the Yavapai lodge for the night and then headed out to Yavapai point to watch the sun go down. It was a great first view of the Canyon, though the temps were already dropping into the 20’s as the sun went down, so we didn’t hang around long. We drove back out of the park to Tusayan for dinner at a steakhouse (Big E? ), which was mediocre and expensive, but did the job. We then returned to the hotel to get everything packed and together for the next day. Of note, the Yavapai lodge’s walls are very thin, pray you don’t get a room next to the metal stairs at the entrance. The next morning, we grabbed breakfast at the lodge restaurant, which really was pretty good, and not just because it was going to be our last non-trail food for days. We parked our car at the Backcountry Info center and walked over to the bright angel trailhead. Temps were in the 20’s when we started down and the first 2 miles or so had significant snow and Ice. Our microspikes took care of that no problem. It was not crowded at the top, but neither was it deserted. We passed a couple groups of college kids (Xavier? and Penn State) who were dayhiking down a ways in their tennis shoes. I hope they made it back up OK, they were having enough trouble going down. I shed my wool cap and coat at the 3 mile mark as the temps had started to warm up into the 50’s the farther down the canyon we went. We made it the 4.8 miles and >3,000 foot descent to Indian Garden campground early in the afternoon. This campground is built up with picnic tables, sun shades, toilets and water. It’s a busy camp site, more akin to car camping. We grabbed a plot, stored our stuff and headed further down the trail another 1.6 miles or so to Plateau point. Plateau point is at the rim of the inner canyon with ~1000 foot cliffs down to the Colorado river. The temps were now maybe 60 degrees and the sun was shining, so we spent a few hours lounging in the sun and gawking at the inner canyon before making our way back to Indian Garden. The sun fell behind the canyon rim at about 4:30 there and it gold cold quickly. We ate fast and spent the rest of the evening in our sleeping bags in the tent playing cards and reading. Low was about 25 that night, and my wife almost ended our trip right there. Day 2 of the hike was our long day, so we got up and moving fairly quickly and started down the tonto trail westward. We did about 11 miles along the tonto trail that day, which is unmaintained single track through the desert. There are no crowds here, we saw 3 other hikers in 2 groups the entire day. Temps were in the 60 degree range, but it felt much warmer with the direct sun. The trail didn’t gain or lose much elevation and snaked along the plateau between the inner and outer rims of the canyon. There is no potable water over that period, so we were pretty laden with extra. We finally made it to Monument creek where we refilled a little water and we headed the 1.75 miles and ~1000 foot descent to Granite Rapids where Monument creek meets the Colorado River. It was gloriously warm at the river and we made camp on a perfect white sand beach. We lounged on the beach and watched the stars come out well into the evening. It was absolutely beautiful and, with the exception of 1 other couple who camped 100 yards away who we neither heard nor saw, it was all ours. After an awesome night of sleep under the stars, we took our time getting going the next day. Eventually, we started the climb back up Monument creek and over to Hermit Creek for our next campsite. This was a fairly uneventful 5 mile hike (other than the constant, jaw dropping panoramic views, of course), we did not see any other hikers until we got to hermit creek. This was our only day of hazy clouds and no direct sunlight, but temps were very comfortable. Hermit creek is moderately built up, with a bathroom and a place to hang your packs. We actually chose a spot well away from the creek about 2/10th mile back up the trail as we had to back track out the next day and we wanted to avoid any additional elevation loss down to the creek. We walked down to the stream for water and to relax. We talked to a group that was there with a couple guides, everyone was very friendly. They gave us some potato chips (it helps to have a guide carry a massive bag of food for you). We returned to our tent when the sun went down for dinner and another comfortable night. Day 4 was the day we were dreading. We got up early and started our ascent back up the canyon via Hermits Rest trail. The trail out was between 8-8.5 miles with about 3600 feet of elevation gain. It’s a remarkable climb through geologic history, about 4 different climates and an entire range of plant life in different stages. It took us about 6 hours to hike that out and we were absolutely gassed by the end. Temps at the top were a merciful 45 degrees. The group with the guide passed us on the way up and gave us more potato chips, which is what gave my wife the will to survive the last push up. The closer we got to the top, the more dayhikers we started to see, though no where near as many as on Bright Angel. Once at the top, we loaded the shuttle for a short trip back to town and our car. From there, we went back to Tusayan to a Mexican joint where I promptly ate a burrito and drank a beer in about 3 minutes total. Overall, an amazing trip with non-stop gorgeous, panoramic views of the canyon. I figured I’d get sick of them by the end, but never did. I had to keep stopping to turn around and soak it all in. It was a challenging hike, especially doing the ascent after we had already hiked all those miles, but well worth it to see a part of the canyon few ever see and a night sky with no light pollution. I would go back in a heart beat, not sure I’d be able to convince my wife, I think she’s counting it as a “once in a lifetime” type trip. Great recap! The night sky without light pollution is something I hadn't considered but now am looking forward to.